You are a music lover and understand that the best way to enter heart and mind of your prospect is through music. Keeping that in mind you are searching for a table top gift which can carry your brand prominently and can doubly excite your target audience. And rightly you have come across Wireless Speaker with universal phone compatibility within your budget. Ideal table top Corporate Gift for the music lovers! You just need to place your phone on the top of the device to experience the 2.0 stereo Wireless Speaker with easy single button operation. Now a day’s offices have started playing soft music to help employees perform better and here is that device which sits on your target audience table to remind them about your brand all day long. Even visitors will note the device and your brand when they visit the particular office due to prominent display of the wireless speaker on the table. Use of the wireless speaker. You can adjust the volume of the music by shifting the phone on the speaker to loud or low depending on your mood and area of the room. The 2.0 stereo sound will enhance the music experience. Easy single button operation with 2.0 stereo speakers which can continuous playback music for 19 hours with 3 x AA batteries. 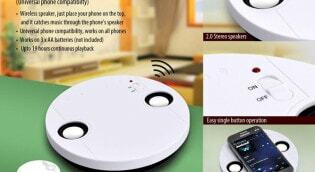 Simply put your phone on the top of the wireless speakers which is compatible to universal phones. The MRP of the product ranges between Rs.650 but on bulk buying it will be offered at an attractive price depending on the exact product, branding, customized packaging and quantities. We will try to understand your objective of gifting and products already shortlisted by your team and help you further fine tuning the requirement within your given budget and time frame. To help you achieve the parameters set by your team we will show you physical samples with finished look to zero down on the gift. Once you and the team are confident that everything is in order then you can place your order comfortably and can start focusing on other challenges to achieve your overall objectives.